Wessal Kenaio is a high school science teacher from Orlando, Florida. She has taught middle school as well as high school science, and has taught marine biology to high school students at Duke University. In addition, she has been involved in marine education at Marineland, Miami Seaquarium, SeaWorld, and the Dolphin Conservation Center. Marine Science has always been an interest, and teaching is a manifestation of that interest for her. 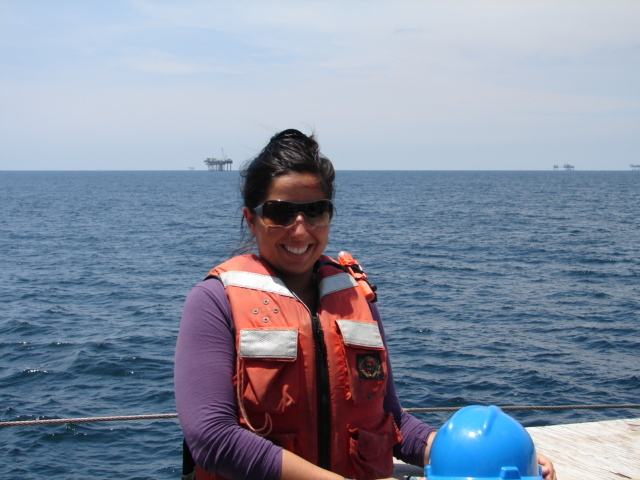 On board the R/V Endeavor Wessal will be working alongside Cris Wagner and the esteemed scientists on board to bring back a new found knowledge of the biogeochemistry of the Gulf to her students at Ocoee High School. A: I have always wanted to be involved n Marine Science. Being involved in education came secondarily but with welcome fervor. It wasn’t until after college that I realized how teaching allowed me the ability to share an interest with lots of people. It was then that I embraced a career in education. A: In high school I focused my efforts on math and science classes as I knew from early on that I wanted a career in science. My major in college was Marine Biology with a minor in Chemistry. The best thing I did in high school to prepare myself was not the classes that I took; it was volunteer work in the sciences. A: Figure out what interests you and get involved now. You are not too young or inexperienced to get started volunteering or interning at any local institution in the field of your interest. Get out there and find places where you can get experience related to what interests you.